I've been playing around with different harps the last little while, slowly trying out different makes, models and keys. I bought one of these in the key of G, let me tell you, HUGE MISTAKE, HUGE WAS OF MONEY. This harp is, for me, about the same quality (or lack thereof) as a $10 "Blues Band" harmonica. Low volume, uncomfortable to play, and leaky as all get out (I actually can't believe how badly it leaks, on the low notes especially. For the money they charge its absolutely disgraceful.). I own several other harps, including two Marine Band 1896s, but this one is by far the worst of them all. The folks at Hohner should feel a massive degree of shame for lending their name to something of such horrible quality. The only reason the review has any stars at all is because it won't let you rate it as 0. But rest assured, this is a 0 star instrument. My advice if you're in the market for a cheaper harp? Get yourself a Suzuki Bluesmaster. $10 cheaper than the Big River, louder, more comfortable, and AIR TIGHT. Avoid the Big River Harp at all costs, don't make the same mistake I did. I play special 20 and Suzuki Manji among others.This Big River harp has a great sound and nice feel. $10.00 cheaper than a Marine Band 1896 and with a plastic comb it will last a long time.I have a couple with me all the time and love playing them. Great value for the money and a good gift for a beginner.Buy it and try it. So, my very first harp was the hoodoo 3ps set from hohner. If I carved a harmonica out of soap it would e a step up from that, so I wasn't expecting much when I purchased the big river. But, the look, feel, weight, taste(not like plastic) and of course the sound, are more than night and day in difference. The big river seems to be on the lower end of pricing because I got it for about 26 bucks which is great, considering the quality. 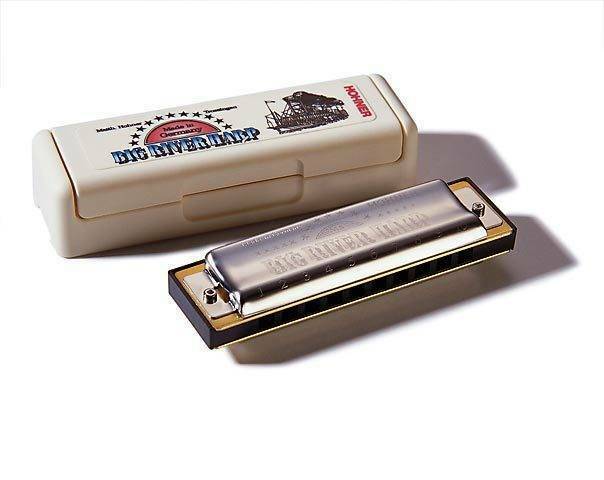 If your just starting to learn, start here with this harmonica, awesome product, awesome value, awsome full, rich sound, soo fun to play. Great bends, replaceable reed plates, easy to clean. Buy it. Nuf said.